G Reghu was born in 1959 in Kilimanoor, Kerala. 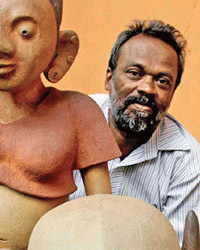 He studied sculpture at the College of Fine Arts,Thiruvananthapuram. Though he began with stone as a medium, Reghu’s sensibility gained direction after his contact with Elizabeth and Laurie Baker along with their Gandhian philosophy of working with indigenous materials.As a final year student, Reghu participated in an All India Students’ Camp organized by the Roopankar Museum of Fine Arts at Bharat Bhavan, Bhopal. J. Swaminathan, Director of the Museum, spotted Reghu’s talent and awarded him a scholarship for two years to work at Bharat Bhavan. Reghu remained at Bharat Bhavan for 15 years where he shifted to ceramic and terracotta art, largely improving his skills. Through his close association with Swaminathan he gained “a benign outlook towards the dispossessed”, using their life to inspire his work. Soon after Reghu abandoned pottery and turned to the ceramic tradition of sculpture. It was clear that he was beginning to find his métier. The work was being shaped by an artist who showed an intimacy with the tactile processes of using his hands: patting mud walls, throwing the clay–the medium and method reflecting his familiarity with a rural lifestyle. Using the processes of hollow-modeling, slabbing, folding, coiling and pinching, Reghu began to evolve a racial type that mingled Dravidian and African facial features – evocative of an ancient civilization. His ‘heads’ exude both a warmth and classical austerity, typical of his work.From here Reghu moved to his present preoccupation, an exploration of the human form. The Ceramic Presence, a solo show held at Art Heritage in 2015/16 is clearly inspired by the artist’s own agricultural background, and the Gandhian ideal of working with local materials. The figures themselves are doll-like and employ traditional folk motifs – some of the sculptures displaying playful groupings of women and children at leisure, in expressions of joyous celebration and wonder. Since 1988, Reghu has held several solo shows and participated part in a number of group shows. Among them: “To Encounter Others”, Stoffwechsel, Kassel, Germany, 1992;the Contemporary Indian Art Biennale, Bharat Bhavan, 1995;“For Contemporary Art”, Sans Tache Gallery, Mumbai,1998; International Biennale Exhibition, Cairo, Egypt, 2000;“Shaping Clay”, India Habitat Centre, New Delhi, 2013. Reghu has participated in several major art camps held across the country.He is the recipient of the Award of Fourth Contemporary Indian Art Biennale, Bharat Bhavan, 1987 & 1988 and also the Bombay Art Society Award, Mumbai, 1998.